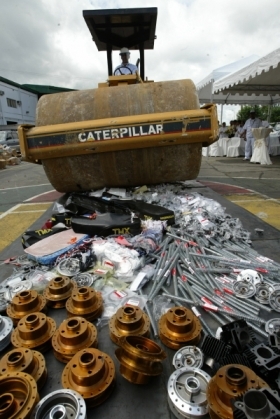 A steam roller flattens counterfeit car spare parts in the Philippines. MUNICH -- German suppliers are adopting a new weapon in their efforts to stop illegal copying of their components. Robert Bosch said educating consumers to spot counterfeit parts is playing an increasing role in keeping product piracy in check. "The education of the consumer is highly important to us," said Wolfgang Saueressig, Bosch's head of automotive trademark protection for the Asia-Pacific region. At Bosch, a 15-digit coding scheme is integrated into safety labels, along with hologram strips as well as other overt and hidden features, as an aid to identifying counterfeits. "With this code, it's possible to check the authenticity of products from any spot in the world online," Saueressig said. "To this end, the dealer, the workshop or even the consumer enters the numerical code over the Internet into the checking website, www.protect.bosch.com and learns whether an original Bosch product is involved." For companies, the costs of piracy are huge. ZF Services, a subsidiary of the ZF Group, cited industry estimates that counterfeit components represent more than 10 percent of the market in the replacement parts industry. Most counterfeiting takes place in China and other Asian countries. Mahle Aftermarket Managing Director Arnd Franz said: "We will give no quarter in the protection of intellectual property." Mahle has mainly had to battle the counterfeiting of piston rings and filters, along with other engine parts for the aftermarket. Schaeffler Group, a leading manufacturer of bearing products, recorded an increasing number of cases of counterfeit parts in 2009 compared to 2008. "The basic rule is that nearly everything is counterfeited," said Ingrid Bichelmeir-Boehn, who deals with the issue of product piracy at the Herzogenaurach-based supplier. "With every case, we learn more and find more counterfeits as a result," she said. In 2009, the supplier recorded more than 100 actions in which counterfeit products were seized. Furthermore, "some customers are increasingly looking for apparent bargains due to the economic downturn," she said.